Should you wait for the iPhone 5? It appears that enough of the world is to cause sales of mobile phones to dip a palpable 2.3 percent, according to fresh market data covering the second quarter of this year. Granted, not everyone holding out for an unreleased handset is waiting on the iPhone 5, yet there is little doubt that Apple’s long-rumored smartphone is generating major buzz. When Apple announced results for the June quarter, many analysts and investors were disappointed that iPhone sales “only” increased 28 percent to 26 million units. This lack of hyperbolic growth has affected the industry overall, which saw sales decline 2.3 percent on unit volume of 419 million handsets. “High-profile smartphone launches from key manufacturers, such as the anticipated Apple iPhone 5, along with Chinese manufacturers pushing 3G and preparing for major device launches in the second half of 2012, will drive the smartphone market upward. However, feature phones will continue to see pressure,” said Anshul Gupta, principal research analyst, Gartner. And, of those hundreds of millions telecom widgets shifted from A to B last quarter, smartphones accounted for 36.7 percent of the total, growing 42.7 percent last quarter. Alternately, is Apple’s unit volume growth slow-down weighing on the cellphone market? Perhaps. Whether folks wait for iPhone 5 or not, Cupertino will continue to sell millions of units of what is still by far, the world’s most popular smartphone. What’s your take? 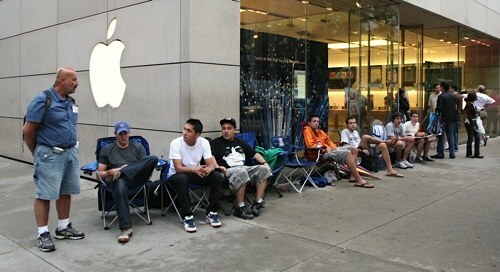 Are you waiting for the iPhone 5?